Maps and RPG’s are like peanut butter and chocolate, and they’ve been that way since J. “Rowdy-Roddy” Tolkien and his generation first started adding fantasy cartography inside the front covers of their books. Maps are stories unto themselves. 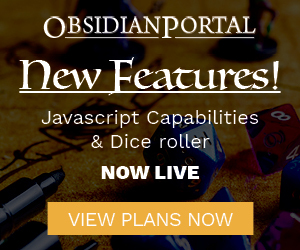 Obsidian Portal has a special section just for maps for your campaign(s), and they can really add a lot of visual interest to your legendary layout. Assembled here are a few tricks and tips to help you advance your atlas onto your page. It’s a classic. The bar brawl. And with a little prep-work when world-building, you can make your ale houses, pool halls, and common rooms uncommonly perfect for a proper fracas or a beer-fueled brouhaha. There’s a little collection of random tables called “20 Things in an Orc’s Pocket” which contains all sorts of fun and simple randomizers to add details to your castle corridors and gloomy goblin lairs. When I found it, I started thinking about how potent the practice of using minutiae in games can be, and how GM’s who pepper their worlds with the spice of small specifics are really breathing a subtle-but-important kind of life into their creations.